all images via JULIAN & Co.
Back in January, I introduced a new partnership with JULIAN & Co. and told you to keep an eye out for a great giveaway. Well, it's here! I also thought I'd share a bit more about the awesome gal behind those tiny hands and feet. Click here for more about how Tania started her company, then read on for a little Q&A and details on how to win $50 to spend at JULIAN & Co.! QS: What's your best-selling piece? Tania: During the holiday season The Tiny Nameplate Ring came in first for bestseller, and during Mother's Day it's The Birth Necklace Round Small. Throughout the year, all the pieces seem to sell pretty evenly. QS: What inspires you to keep creating? Tania: Gosh, I don't know. Sometimes I see or think of a phrase or word and will be inspired to get to work. I'm a minimalist at heart, and I think my jewelry reflects that. There's a line I've been working on (on and off) for four years. It should be out by April, and although it's simple, I had to sharpen my metal-smithing skills, dust off the drill press, and learn how to bezel and flush set stones. QS: What are you currently reading/watching/pinning/tweeting? Tania: I'm reading A Wild Sheep Chase by Haruki Murakami, watching Walking Dead and The Following (I love suspenseful thrillers because they are captivating and help me completely unplug), I seem to be pinning a lot of new recipes I want to try and sewing how-tos, and tweeting? still getting the hang of that, but I do the happy dance every time I get a new follower. QS: Who would you love to see wearing a JULIAN & Co. creation? Tania: I love when I see anyone wearing a JULIAN & Co. piece. The standard new baby gift is our ID Bracelet, and when I see it being worn, I love love love it. QS: Describe a typical weekend for you. Tania: Julian is playing tennis now, so we do that on Saturdays... we most always hit the beach for a walk, catch up on cleaning and hanging with friends. Thank you, Tania, for sponsoring this fantastic giveaway for Queso Suizo readers! HI Amanda! I would spend it on the Tiny Nameplate Bangle and I would wear it with a nice dress. Hi Andreea! Yes, that bangle is darling, and I've had my eye on it! That would be so sweet! I would love one of the small nameplate bangles. I also like the Purse Fob. Yes, you can't go wrong with the nameplate bangles. so dainty and chic! the tiny name plate ring is so precious! Yes! I love that they are stackable, too! Indeed you will! One for each of your precious littles! 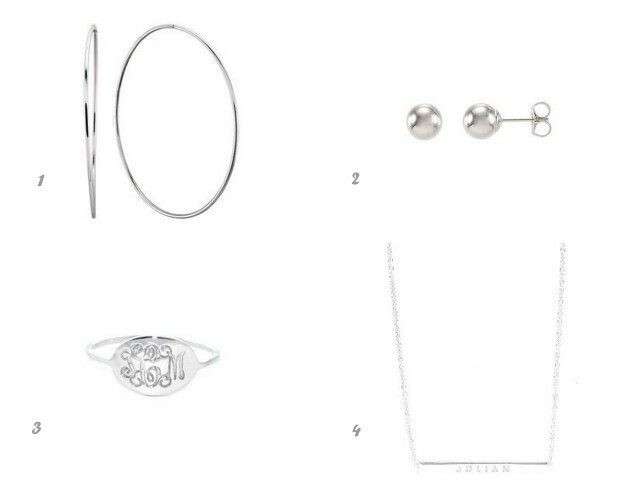 Tiny karma ring and tiny nameplate ring are sooo yummy! I just love all their tiny pieces. so fun and feminine! Oh, I NEED necklace with my boy's name on it!!! ...but I want a ring too, with his initials on it. Eek, what to choose?? Hard to choose, I know. I love all their pieces! !